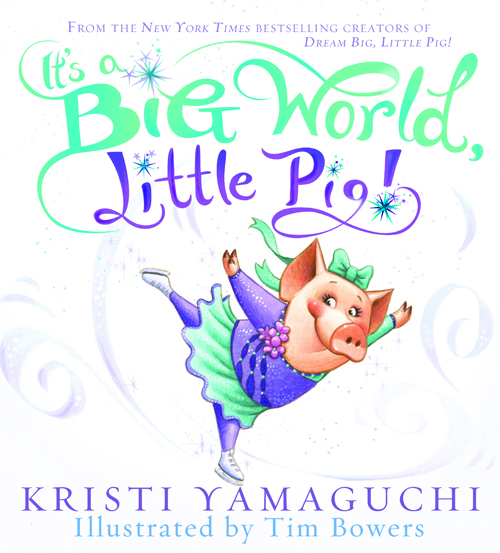 If you and your little ones enjoyed reading Kristi Yamaguchi’s debut children’s picture book, Dream Big, Little Pig, then get ready to cozy up before bed with a new adventure for the adorable Poppy the Pig as she continues her ice skating escapades in Kristi’s forthcoming sequel, It’s a Big World, Little Pig! It’s a Big World, Little Pig! follows the precocious Poppy as she travels to Paris to compete in the World Games. At first, Poppy is nervous about meeting so many new people in a new place. But, ever courageous and supported by her family (and best friend Emma, too! ), Poppy begins to realize that although these animals look different, act different, and are from different places, they are all the same at heart. They all smile in the same language! Like the first book in the series, It’s a Big World, Little Pig! is a beautifully illustrated book with an important message, and your children will love to read this one over and over again with Mom or Dad! Hitting bookstores on March 6th, 2012, It’s a Big World, Little Pig! is a must-read this Spring! To learn more, or to order, visit www.kristiyamaguchi.com. http://tinygreenmom.com/wp-content/uploads/2018/07/logo-sm.png 0 0 Tiny Green Mom http://tinygreenmom.com/wp-content/uploads/2018/07/logo-sm.png Tiny Green Mom2012-02-20 12:48:062012-02-20 12:48:06It’s a Big World, Little Pig!